A bunch of new things in my life, but most significantly, I am now officially an Electrical Engineer! 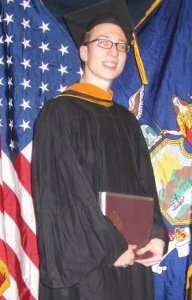 I graduated from Cooper Union as a Bachelor of Engineering (BE) in EE, and will next be beginning my graduation work. I figured I should probably post a news article about this, as I recall posting one when I graduated high school four years ago. As then, I'd like to share a brief overview of my programming plans for the summer. Unfortunately due to commitments they're quite brief indeed, but I do tentatively plan to try to bang out some if not all of the work I need to on Doors CS 7. We'll see how that goes. From my lessons of last summer, I think I'll forego making deadlines for now. In other news, I was gratified to see that I recently passed Marcos Lopez once again to reach #11 of all time, with just under three-quarters of a million downloads on the venerable community calculator site ticalc.org. Here's to another quarter-million soon after I get Doors CS 7 finally completed. Thanks Eeems. I plan to try to start staring at the Doors CS 7 code either this weekend or next week; I'm interspersing it with some work on my thesis. sweet! now we can see some progress! Hopefully. Once again, no guarantees, and although I don't think my z80 has gotten too rusty, I'm way out of touch with the monstrosity that is the Doors CS 6.2 program flow. I'm way out of touch with the monstrosity that is the Doors CS 6.2 program flow. Perfect time for a re-architecture then. Start DCS 7 from scratch, and cut out failures like cn2 and gcn. That actually doesn't sound like a bad idea. Despite all the extra work I think it could use a rebuild. I really thought that the topic title meant that you had graduated with the 11th best GPA in Cooper Union's history. That would have been much more epic. But still, grats on both. And good luck figuring out Doors again. @foamy3: No, afraid not, sorry to disappoint you. That would be hard to do, I'm sure there have been eleven people with 4.0s, although none in the past 8 years. The closest someone got at my graduation was a single B+, bringing them down to 3.995. If I was 11th at Cooper, I would have used a comma instead of a semicolon in the title. @ZagorNBK: Thanks for the enthusiasm, I hope that I can live up to it. Glad to hear it and thank you again, respectively. If I was 11th at Cooper, I would have used a comma instead of a semicolon in the title. Ah, but isn't a semicolon used to link two sentences on the same topic? Hey, I am significantly better in English than most of my engineering peers; I value my ability to express myself. See, I used the semicolon properly in that sentence. I actually overuse the semicolon a lot, which is why I take offense at that. Second: Why didn't take double major English with Electric Engineering? Unless, you already took another major along with EE? Oh believe me, the workload at my school barely allows you to sleep with a single major, let alone a minor or a double major. YAY. Much winsauce was had by all. or the admins anyway. There are 193 users online: 9 members and 184 guests. © Copyright 2000-2019 Cemetech & Christopher Mitchell :: Page Execution Time: 0.184257 seconds.